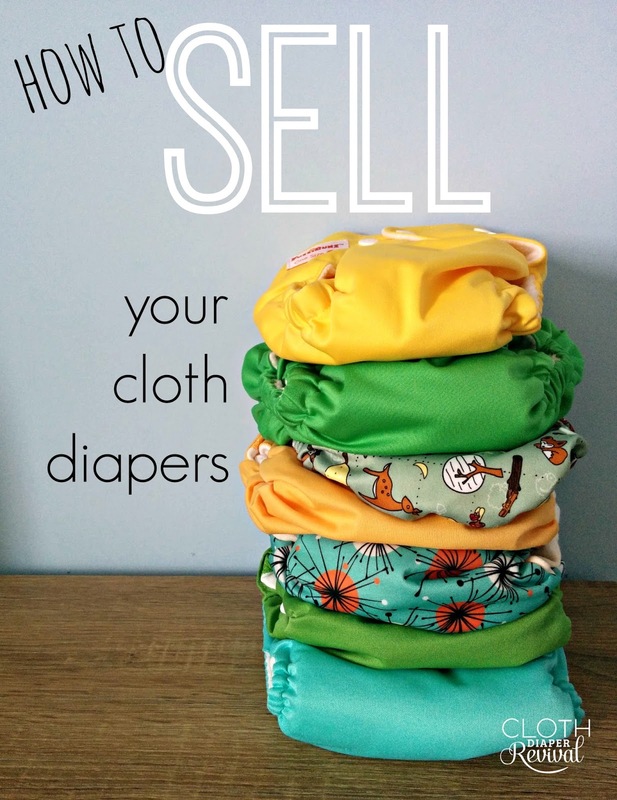 The sad day has come when it's time to say goodbye to your beloved cloth diapers! Or maybe you are ready to celebrate, glad to be done with the days of diaper laundry and spraying out diapers. 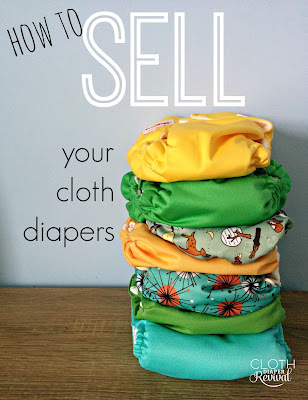 If you're ready to part with your stash, you can earn back a good bit of the money you spent by selling your diapers! Thanks to Facebook Groups, there are lots and lots of places to sell your diapers. These are typically referred to as B/S/T (buy, sell, trade) groups. Many of them are brand specific groups, but there are some broader groups available as well. Other options include selling locally on sites like Craigslist, holding an auciton on ebay, or websites like Cloth Diaper Trader. 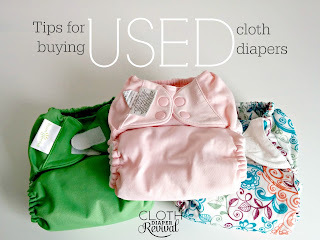 Don't be afraid to list your diapers on multiple sites. Start with clean diapers! If your diapers have any stink issues, you'll either want to treat the issue or be prepared to disclose the problem in your listing. Check for stains! To get the most for your money, having stain free diapers is best. Sunning your diapers is an excellent way to fade stains. Many buyers will still buy diapers with stains. Just be sure to take pictures of all the stains and detail them in your listing. Inspect your elastics. If your elastics are relaxed, you can either replace them or sell them as is. Look for any other problems. Does your organic cotton have holes? Is the PUL still intact in all places? Is the stitching fraying? Is the aplix/velcro/hook and loop curling or no longer sticky? 1. Take lots of pictures! Most buyers will want pictures of the diapers from the front, but also from the inside and pictures detailing any problems. New - new diapers with tags/packaging that have never been used or washed. NWOT - New diapers that do have tags or packaging. These diapers have never been used or washed. 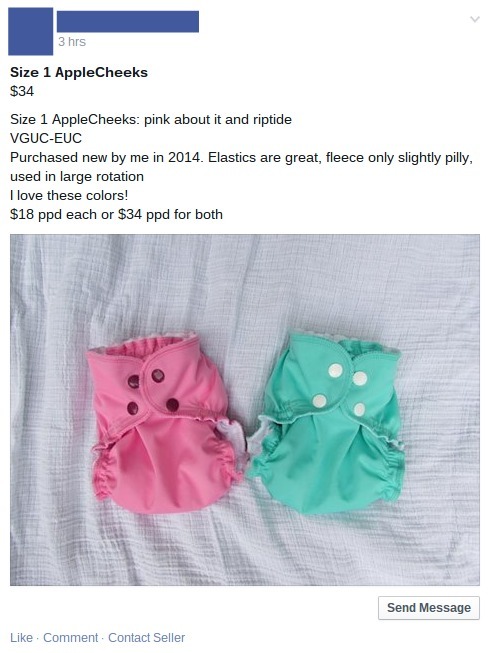 Prepped only - New diapers that have been prepped, but never worn. EUC - Excellent Used Condition. Diapers that have been used, but look brand new. These diapers have no stains or stink, elastic that isn't stretched, and PUL with no problems. GUC - Good Used Condition. Diapers that have been used, but there aren't any major issues. There may be some light staining or slightly relaxed elastics, but overall still have a ton of life in them and are in good condition. Play - Play condition diapers are very well loved! They usually have stretched elastics, holes in the cotton or are just very worn. 3. Decide on a price! This may be the hardest part of all! The best way to find out the going rate for your brand of diapers is to look around other sites and see what the diapers are going for. 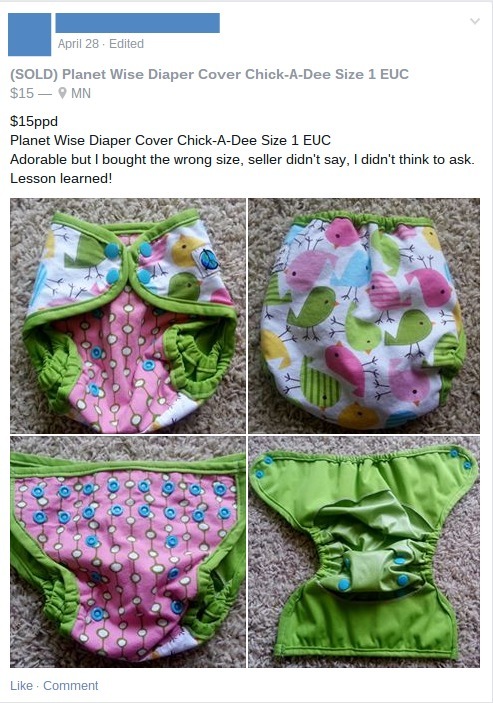 Any issues with the diapers and the condition can cause the price to be lower. Remember that you can always lower your price if they aren't moving fast enough for you. A note about shipping: If you aren't selling your diapers locally, it is typical to add the cost of shipping into your asking price. This is noted by using the abbreviation PPD. Be sure to note if your are only willing to ship to the country you live it. It can be expensive to ship to other countries. In the US, it will cost about $2-3 to ship one diaper, so adjust your price accordingly. 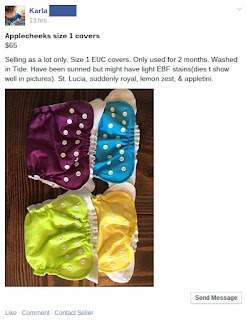 If selling your daipers sounds like too much of a hassle or you want just to bless another family, there are a ton of great cloth diaper organizations available that provide cloth diapers to families in need. You can do a web search to see if you have any local resources, but if you are looking for a reputable national organization try Giving Diapers, Giving Hope or Share the Love. Looking to buy used diapers? Read my tips!